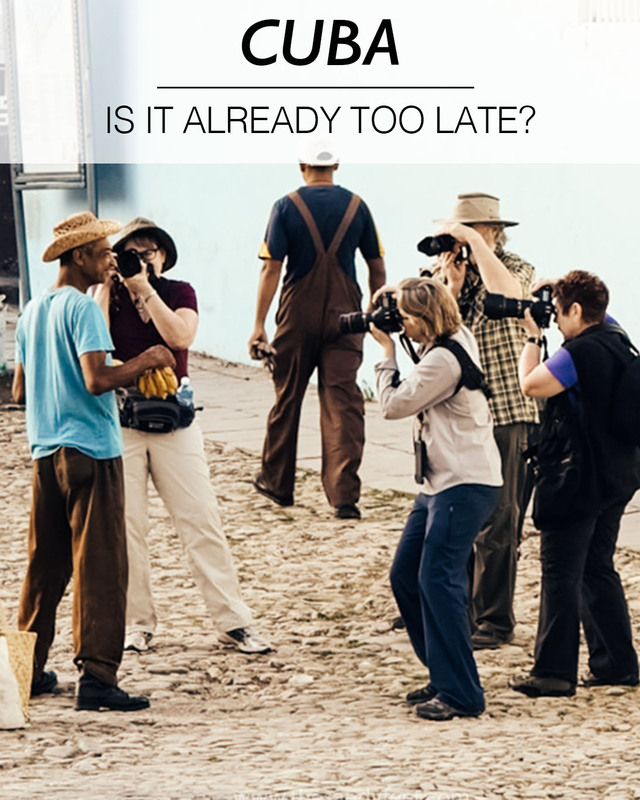 Cuba: Is It Already Too Late? 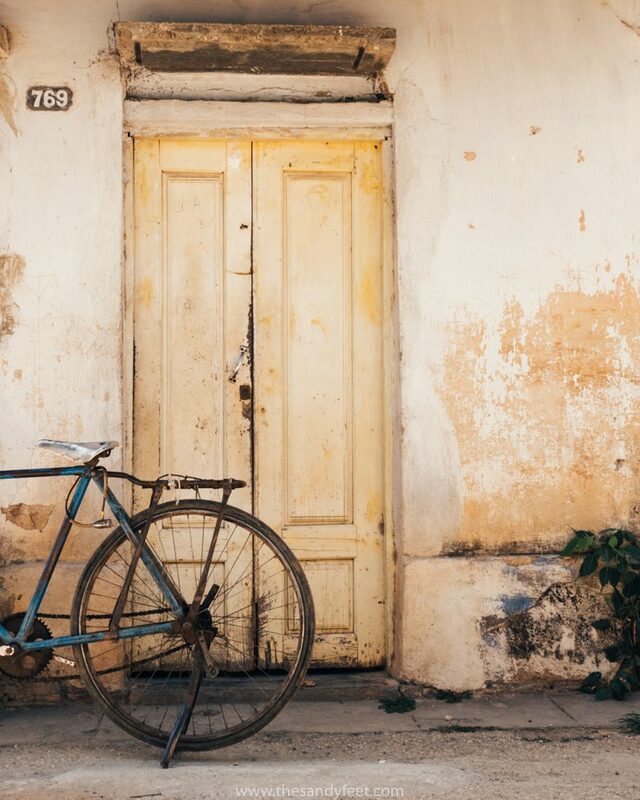 Everyone comes to Cuba with an image in mind. A bright red vintage American car cruising through Havana’s iconic dilapidated streets, old men with cigars and straw hats shaking maracas and strumming dreamily on a double base, curvy ladies with big smiles spontaneously breaking into a salsa, rumba or a cha cha cha on the side walk at the slightest inkling of a beat. This was our vision of the infamous Caribbean island. A country with a tumultuous past on the brink of irreversible change that won a place on almost every travel list for 2016 and is a bucket list destination for travellers across the globe. Cuba has been on our ‘to-do’ list since we can remember and when we left for this adventure over a year ago, we knew we would be making a pit stop on the Caribbean island, one way or another. We arrived brimming with expectation, ready to be blown away, inspired and transformed. There was more anticipation over visiting Cuba than any other country we have travelled. The thing was though that Cuba didn’t blow us away. It merely tickled us with a light breeze. It didn’t leave us misty-eyed with inspiration and the only transformation we felt was the slow decent from excitement through confusion to bitter disappointment. Did we even like Cuba? After three weeks, we still weren’t sure and now, five months later, mulling over our experiences still leaves us a little confounded. 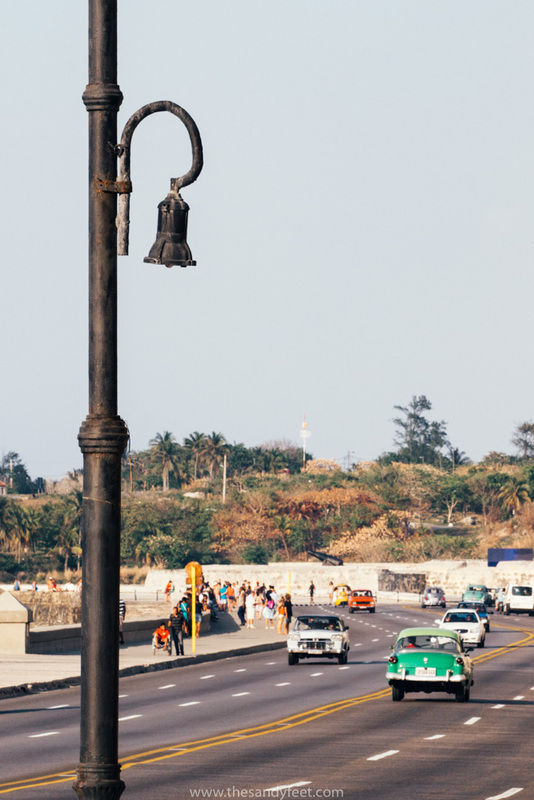 Our journey began and ended in Havana, what is for many, Cuba’s strongly beating heart. 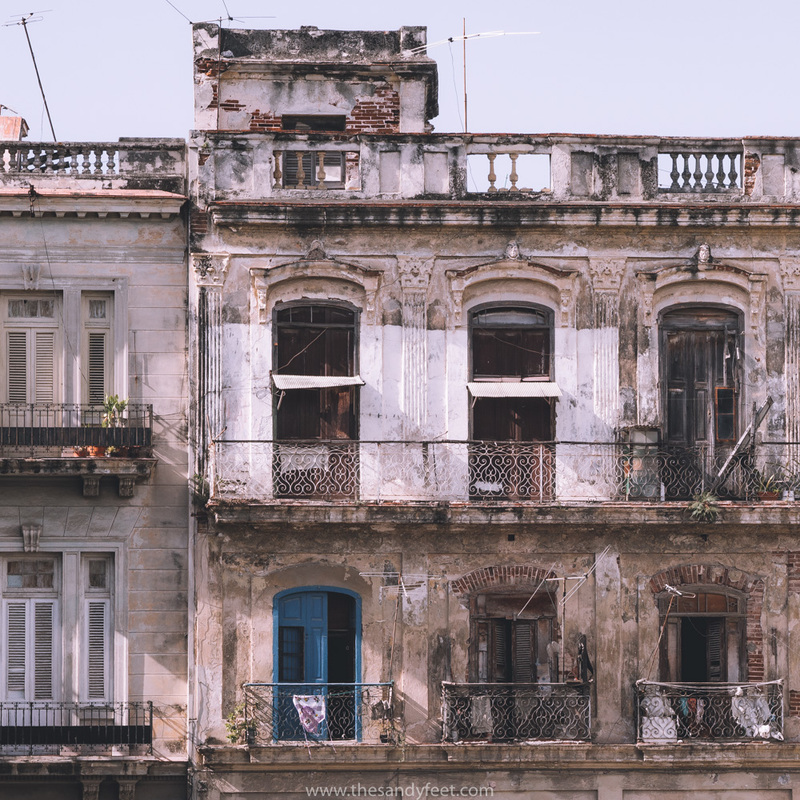 We strolled through the crumbling streets around our casa particular, paint peeling off every wall, water dripping from overhead balconies, passing kids playing soccer in the streets. An old man hovered guardedly over a rickety cart of fruit, peering through his folds of wrinkles and swatting at flies that came within an inch of his produce. Ladies dressed neatly and proudly in bright outfits stood half in, half out of doorways chatting animatedly with friends and neighbours. Classic American cars hummed by in a puff of fumes, looking like a wheel may roll away at any moment. It was messy and chaotic and we lapped it up. Finally we were here, giddy with excitement, ready to soak up the culture, vivaciousness and colour of all things Cuba and we were off to a great start. Our slow amble took us over to Havana Vieja, Old Havana, the beautifully restored part of the city, which was basically the complete opposite of where we had just come from. Vintage cars were brightly coloured and meticulously painted with a fresh layer of polish, parked in groups around town waiting to take tourists for a ride. Somewhere along the white stone streets and leafy boulevards we wandered into a drove of other foreigners. 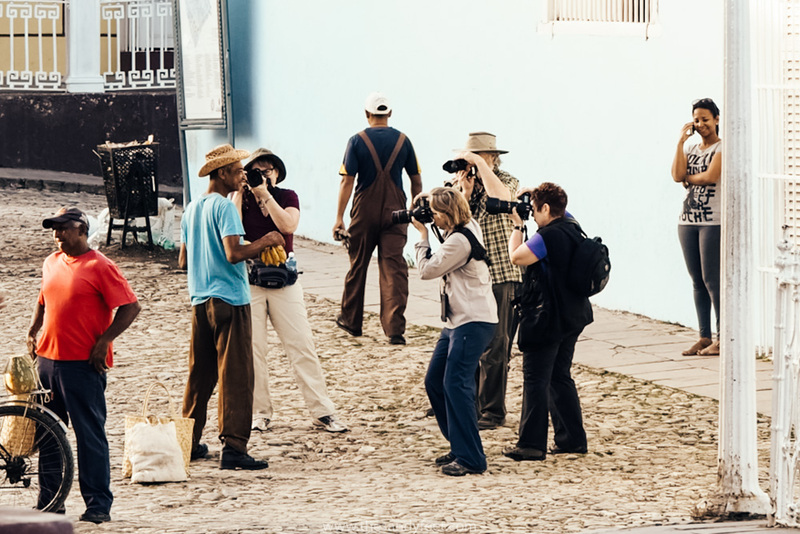 Rather than the lilt and ramble of the Spanish tongue we had become so comfortable with after months of Latin American travel, the harsh Germanic tones and the twang of a variety of English accents was all that met our ears, their bulky cameras never far from their faces. We continued walking in the hopes that the swarm would eventually pass us by, but it was difficult to escape. We saw a local lady slouched over with a bored expression on her face and an oversized cigar hanging from her lips sitting in a beautifully crafted stone doorway among a sea of colourful frills and topped with an extravagant hat. The flock of foreigners circled her, thrusted their cameras in her face so that all parties could get the perfect ‘authentic’ shot, gifted her a few dollars and flittered on their way. This woman sat there, a blank expression on her face, as foreigners came, clicked and went. We walked down to the waterfront to get a view of the nearby fortress and were met with a queue of tour buses as far as the eye could see. Needless to say we turned around and got the hell away from there. Looking back, this was the start of Cuba’s downfall for us. Stupidly, what we hadn’t counted on in our Cuban fantasy was that these iconic streets would be filled with thousands of other tourists. 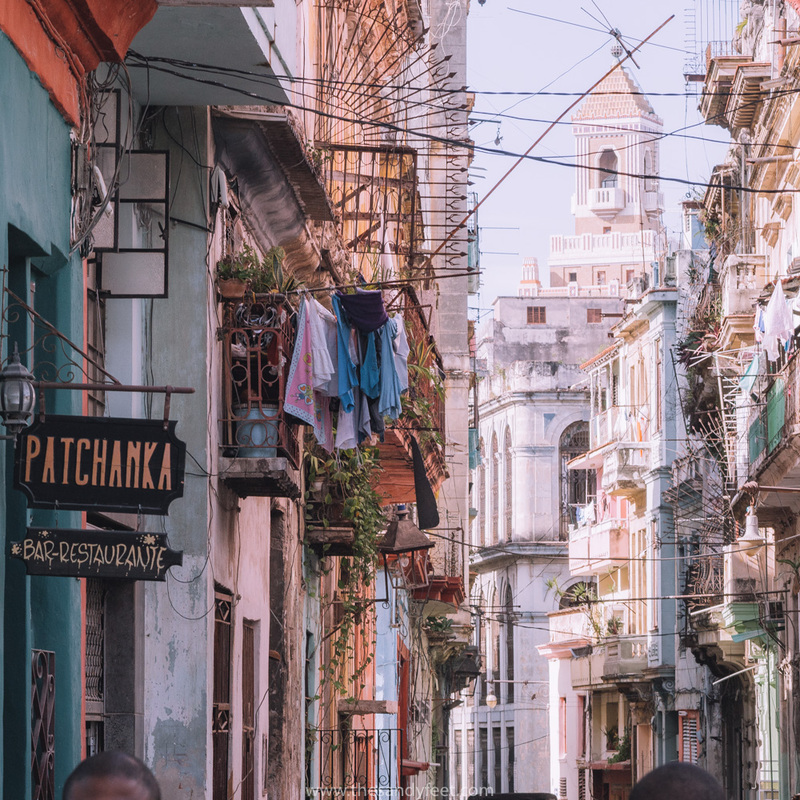 Sure, we didn’t expect it to be completely devoid of visitors and Havana Vieja is probably the most touristed area in the country, but it felt like half of Europe had been hand-picked and unleashed on the city like it was a theme park. 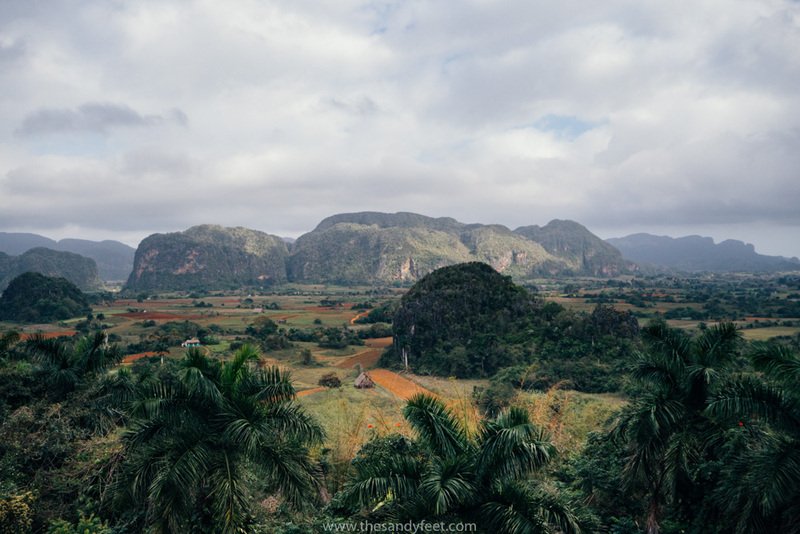 We packed up our stuff, crossing our fingers that the crowds were just stragglers from the high-season and moved on to explore the beautiful limestone monoliths of Viñales. The daily Viazul bus had been booked for days and we had been unable to buy a ticket, so along with another couple from our casa, we had arranged to share a taxi which we negotiated to be the same price as the bus. On our way to Viñales we pulled into a roadside stop for a toilet break… along with about 50 other tourist buses. We were in the middle of nowhere, the countryside of western Cuba, and yet we were surrounded by hundreds and hundreds of other foreigners, milling around in their chic vacation wear and newly bought straw hats. We looked at our driver, he laughed and drove on out of there. The following day when we set off to explore the UNESCO World Heritage Site, Valle de Viñales, somewhere we had really been looking forward to, we once again found ourselves in amongst the circus. The scenery was undeniably beautiful dotted with rust-coloured fields and a smattering of palm trees, but the constant coming and going of buses and ever present swarm of foreigners relentlessly clicking away on their phones and cameras basically killed any ambience you might seek from being out in nature. It is a little hard to appreciate the impressive chambers of an underground cave when you are forced to shuffle along in single file because the narrow path through said cave is completely congested with other people. From here we bussed our way to colourful and quaint little Trinidad, which we knew was a popular stop but hoped would be a little more low-key. When we arrived though we found its beautiful pastel streetscapes and cobblestone pedestrian laneways utterly choked with tour group after tour group, escorted by their guide waving a pink flower or flag in the air. We escaped by wandering off into the rural backstreets of the town where we did see another side to this beautiful place, but every time we wondered back into the tiny centre it felt like we were battling against the current. 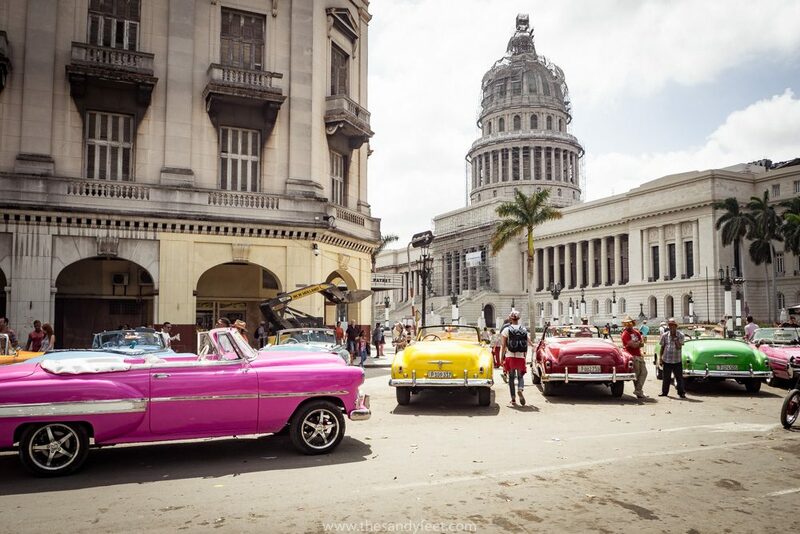 For anyone that’s been to Cuba, you may be shaking your fist yelling, ‘What are you doing? Those are the most touristy places! !’ And you would be right, they were, but they also set the tone for the rest of the trip. When we told people we were going to Cuba we were met with more or less the same response, ‘I can’t wait to go to Cuba. I really want to get there soon, you know, before it all changes.’ We too, a little naively, had uttered the same sentiment many times over. All this talk of ‘imminent change’ that surrounds Cuba had created the illusion that it was some undiscovered and untouched paradise. A new and exotic wonderland to uncover and explore, piece by piece. 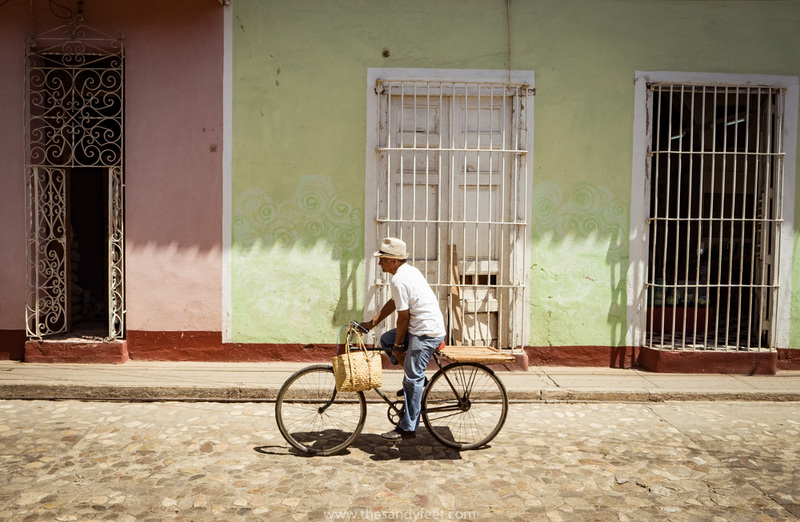 A place where the charms and quirks of the real Cuba continued on unfazed by the tourism revolution waiting on its doorstep. But for all those people we spoke to that said they to wanted to visit Cuba ‘before it all changes’ it seemed another thousand had actually bought the ticket and gone. Little did they know, the changes they were hoping to beat to the punch are already well underway. There may not be a McDonalds or Starbucks, yet, but there are more subtle shifts simmering below the surface. What we found was a country congested with tourists (not everywhere, but many places) and where tourism itself has, in parts, completely disrupted the balance of culture. We were segregated into tourist-only buses and ushered into tourist-only restaurants. We saw locals refused entry into restaurants because they were ‘full’, code for ‘not a foreigner with bags of money to spend’. 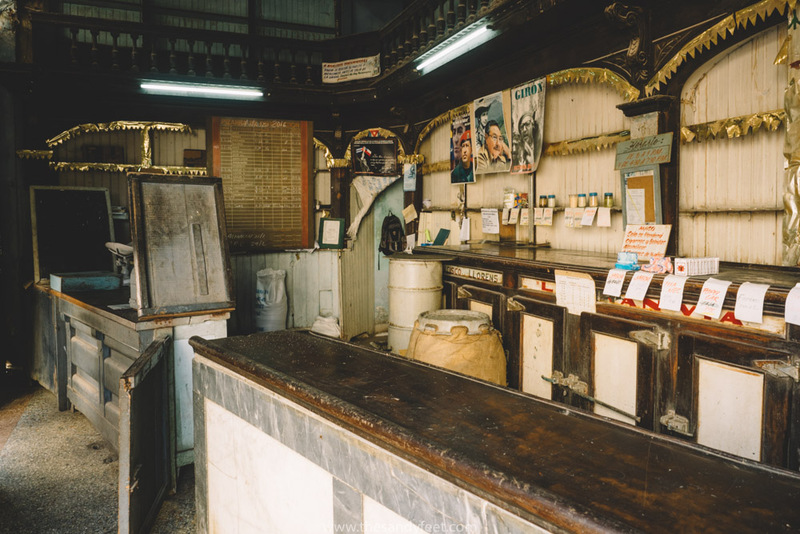 Rather than there being a constant rhythm on the streets, music stopped and started abruptly with the ebb and flow of passing foreigners with the sole purpose of getting coins in the hat that was forcefully thrust in our faces. Ladies ‘spontaneously’ broke into dance on the roadside before berating passers by for not paying to photograph the moment. Everyday we were confronted with these contrived scenes. So much so that we began to wander whether any of the mystique built around this country was real at all. The lady dressed in colourful garb and parading her extravagant hat. The bands we saw playing on the street. 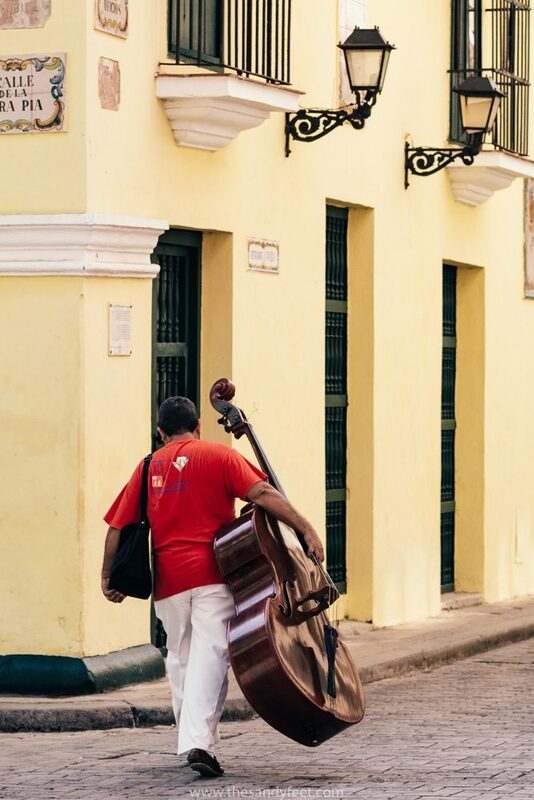 From the outside, when we see these photos splashed across guide books and blogs (ours being no exception) we think they capture the soul and sounds of Cuba. But if they are taking iconic elements that define a culture and presenting them purely as a show for tourists, can that really be thought of as the true essence of a country? 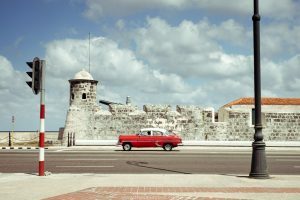 Although great change is expected with the lifting of the US embargo, the fact is that European and Canadian tourism in particular have long reigned in Cuba. It is well and truly ‘discovered’ and the government (and many of the locals) milk it for all it’s worth. When a society is designed to have no division of classes, where everyone is born on an equal playing field, and everyone is poor, access to tourist dollars is an easy way to become, by Cuban standards, instantly rich. 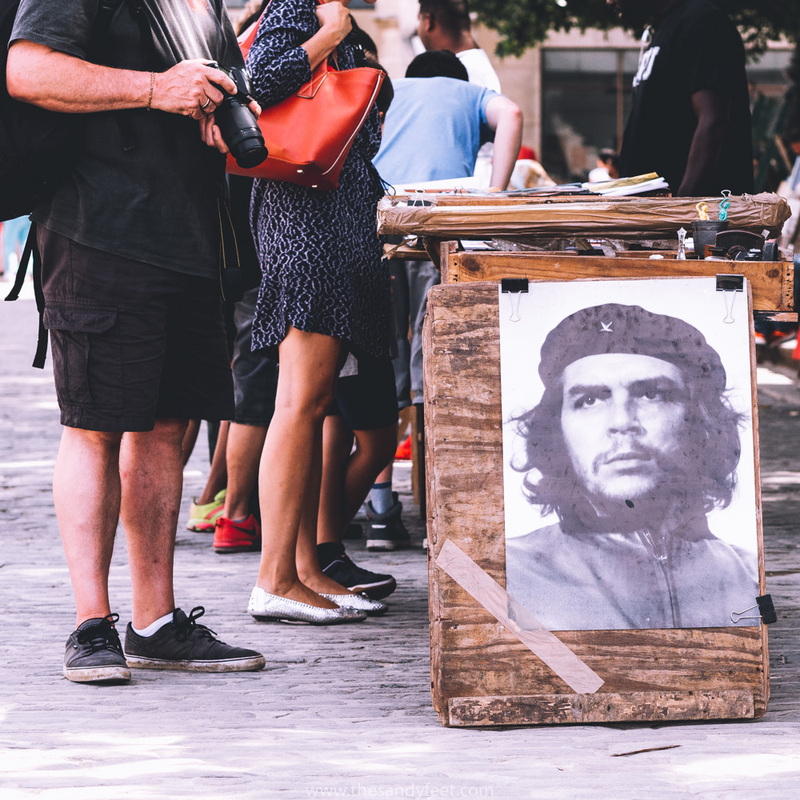 Where wealthy vacationers are the norm, bringing a no-holds-barred approach to their spending, it’s no surprise that many Cubans think all foreigners are made of money. In some cities we couldn’t walk more than a few yards without being hounded. Do this tour. Buy this product. Come see this bar. Sure, these are things you will experience in varying degrees in any poor country you travel to. By simply having the privilege of being able to travel, you by comparison are filthy rich and people will do what they can to part you with your cash. That is a part of travel, one we accept completely and are normally unfazed by. These people live a life of serious hardship and are incredibly resilient and resourceful in ways we couldn’t possibly fathom. Everyone is just trying to get by, to make a living on top of the meagre pay offered by the government. But when every seemingly genuine conversation at some point or another turns into a sale, we couldn’t help but feel frustrated. 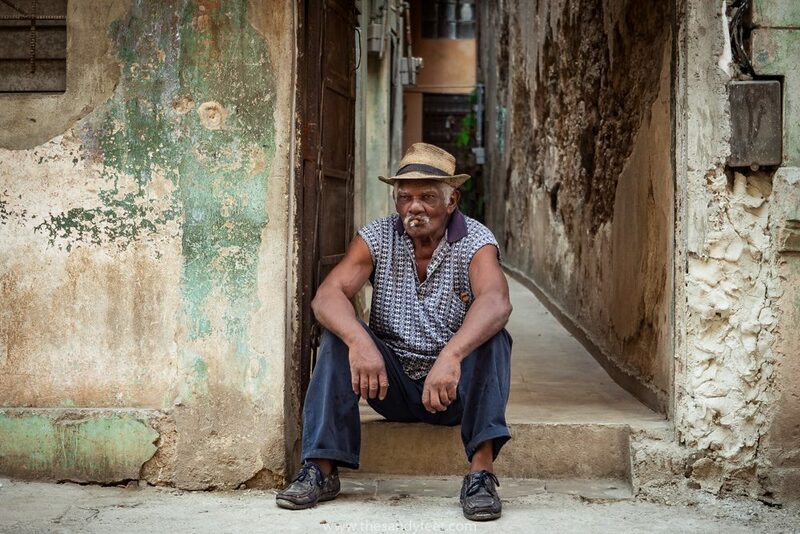 Before visiting we heard so much about the Cuban people – their emanating warmth and generosity of spirit that became the highlight of many travellers’ trips. We are not saying that they were not friendly, because they were, but of all the dozens of people we spoke to, only a very small few didn’t come with a sales pitch, we just had to wait for the punch line. 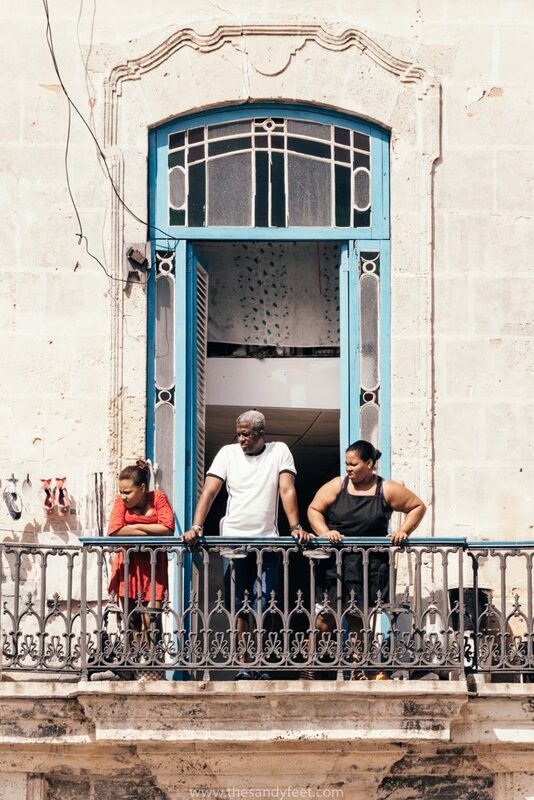 The worst side of this we experienced in our casa particulars where you stay in a room in the home of a Cuban family – a way to support the locals and experience Cuban culture. However, on several occasions our hosts would rapidly change from gracious and informative to very obviously annoyed when we would decline their offers for breakfast or dinner. We ate at least one meal in every casa we stayed at, but as the trip wore on we began to dread the time they would ask what we wanted to eat the following day, knowing that as soon as we excused ourselves to eat elsewhere we would be met with disdain. Don’t get us wrong. It wasn’t all bad. Many elements of our trip we loved. Feasting on a spicy, coconut seafood dish on our rooftop terrace while watching the sun set over the Caribbean in Baracoa was a pretty magical moment. As was exploring the rural back streets of Trinidad or lining up with the locals for a 4 cent glass of freshly wrangled sugar cane juice in Santiago de Cuba. 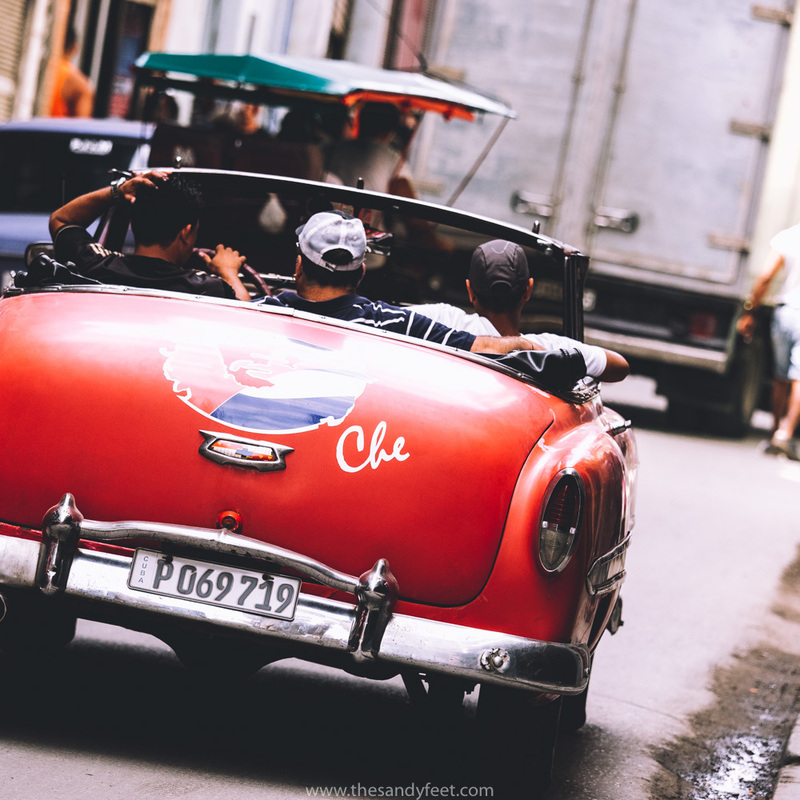 Then there was cruising through the countryside in a vintage Chevrolet with green tweed seats, a Cuban man napping in the back with his hat covering his face while the men beside us chattered non-stop. 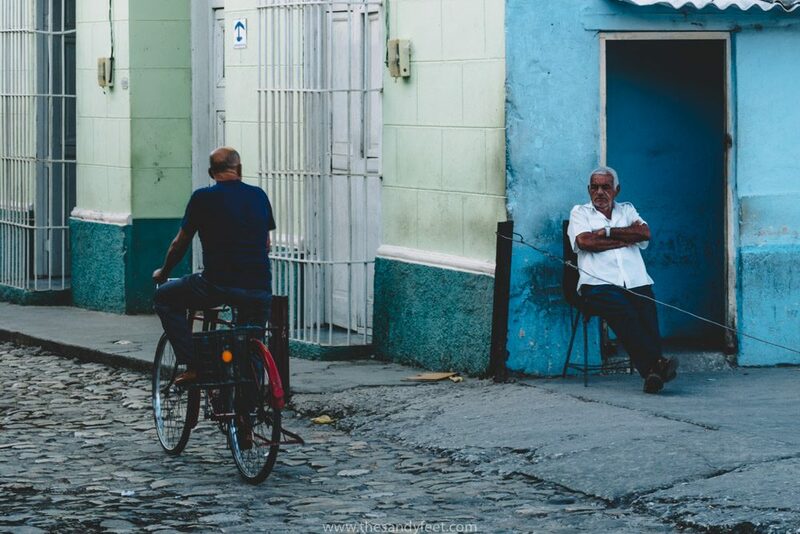 We loved watching movie after movie on Camagüey’s Cinema Street and exploring the crumbling streets of Central Havana where men sat in doorways as silent spectators smoking their cigars, not for show, just because. It is also probably one of the most unique and photogenic countries we have been to. There were the charming idiosyncrasies that made us smile and think, ‘this would only happen in Cuba’, like the endless search for ‘el ultimo’ or the massive dimly lit shopfronts empty except for a solitary carton of eggs or the groups clustered around the public park’s best wifi signal yelling over each other to make themselves better heard over Skype. Had these moments not been so few and far between, so fleeting, we are sure we would have loved every minute of our time here. These were the moments that felt genuine. Where we stopped and thought, this, THIS is why we came to Cuba. When we actively tried to avoid the more overrun parts, get under the country’s skin, these experiences came to us more easily. When we explored the hidden alleyways rather than staying near the centres and sought out the offbeat local paladares that welcomed us with surprise we found that genuine warmth we had hoped for. 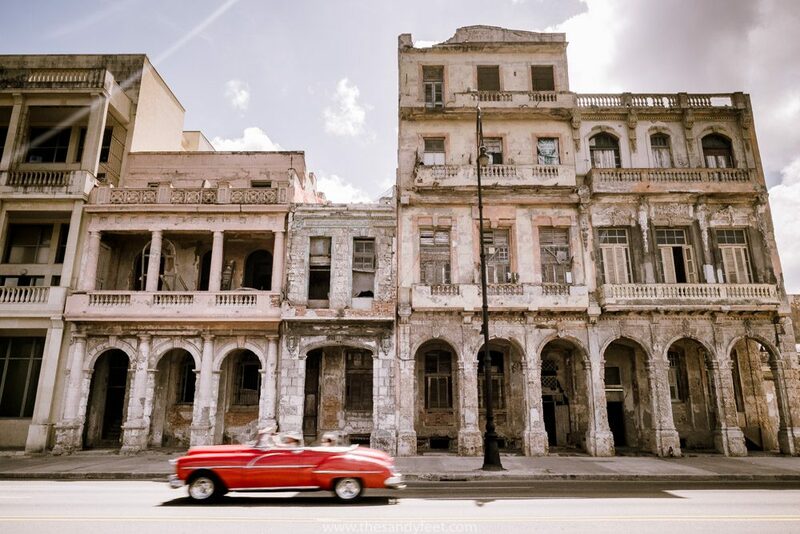 But it is the parts that are not yet touched by tourism that retain that charm that attracts people to Cuba in the first place and keeps them coming back. 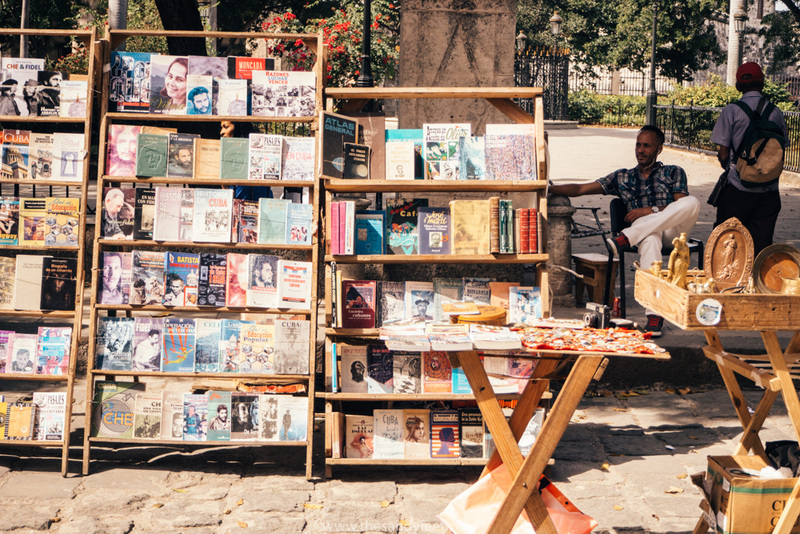 Basically you need to run a million miles from anywhere that is given even a mention in your guidebook, which may seem obvious but in Cuba, this isn’t easy. While it changed our perceptions a little it felt like a shadow was constantly hanging over us. We spent three weeks being plagued by a niggling sensation of guilt that a country we were so desperate to fall in love with failed to make a meaningful impression on us. 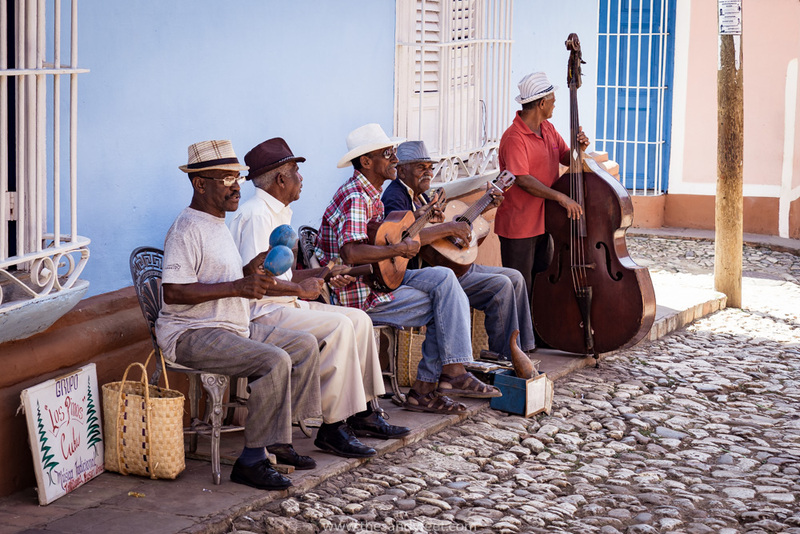 Where was the music and the spirit Cuba is famous for? We aren’t saying it wasn’t there, we just couldn’t find it. It is perhaps relegated to the corners of this island nation where foreigners are yet to infiltrate. We are well aware that we came with impossibly high expectations for our trip but the thing was, when we chatted to other travellers hoping that they could in some way enlighten us to this ‘other side’ of Cuba we felt we were seriously missing out on, hoping to find some glimmer of redemption for this place we so hoped to love, we couldn’t. No one seemed to have a wildly different opinion to our own. They were all having seemingly lacklustre experiences. Like us, Cuba just was not what they had expected and what was left in its place was simply confusion. In fact so strong were these feelings that one guy had even gone to the lengths of getting earlier flights back to Mexico while others were simply glad they had decided on a shorter trip in advance. Harsh as this may sound, never before have we seen travellers have such a strong reaction to a place. 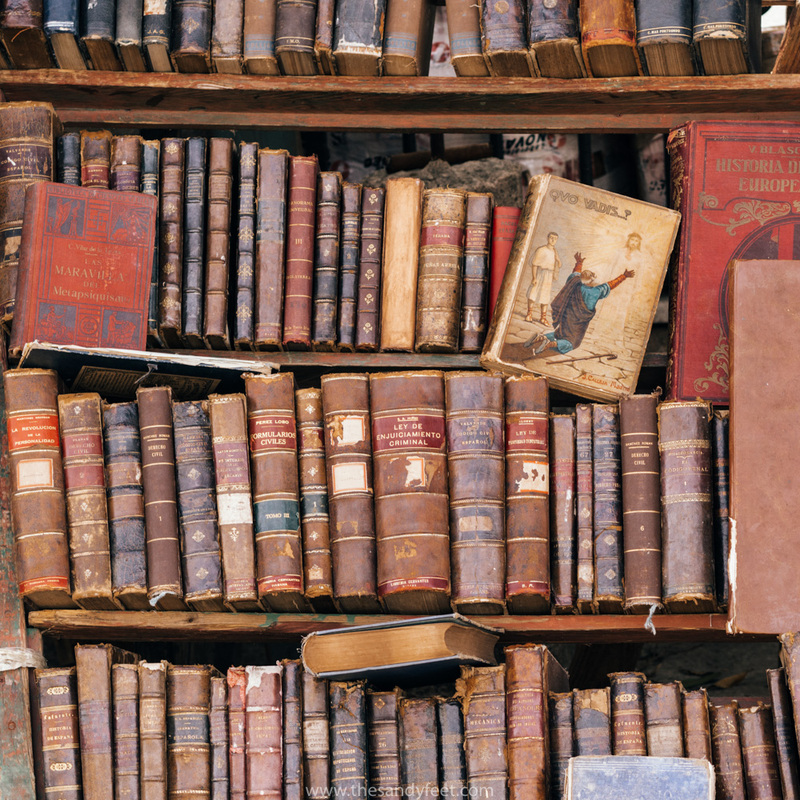 And to be clear these were also not opinions held by just one ‘type’ of traveller. These were upmarket vacationers through to long-term budget backpackers. The one thing we all seemed to agree on though was that it was not Cuba’s fault. It felt like for three weeks we were floating through the country in a bubble. A bubble created for foreigners to see and exist in knowing that the ‘real’ Cuba was somewhere out there on the hazy horizon, always out of reach. We have travelled in many different parts of the world and sadly there are always going to be those places that are overrun and irreversibly changed by tourism, but there are often also those less explored places that you can soak up in solitude just a bus or boat ride away. 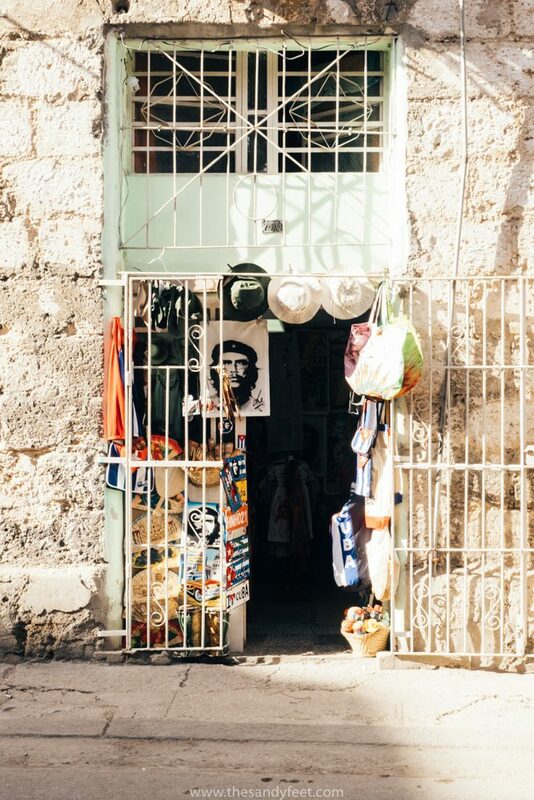 In Cuba though, finding these off-the-beaten path places is one thing, but because of the the government systems put in place, getting there as a tourist can be near impossible. As an outsider, observing a functioning Socialist system that deviates so heavily from our own society is fascinating. So much about the way of life is different. Even visually, a walk through streets that have no signage or shopfront design is a massive change from a world where we are constantly bombarded and manipulated by advertising. 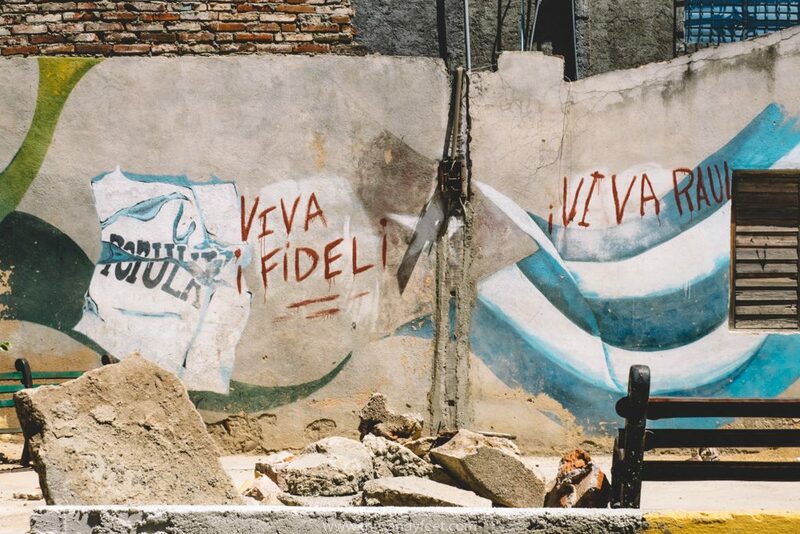 Instead of endless posters imploring us to buy this or that there is propagandist graffiti and highway billboards preaching an unwavering love of the Castros and Socialism. To see this is interesting, something we have never experienced before, but the way tourism sits as a part of this system is what damaged so much of our experience. 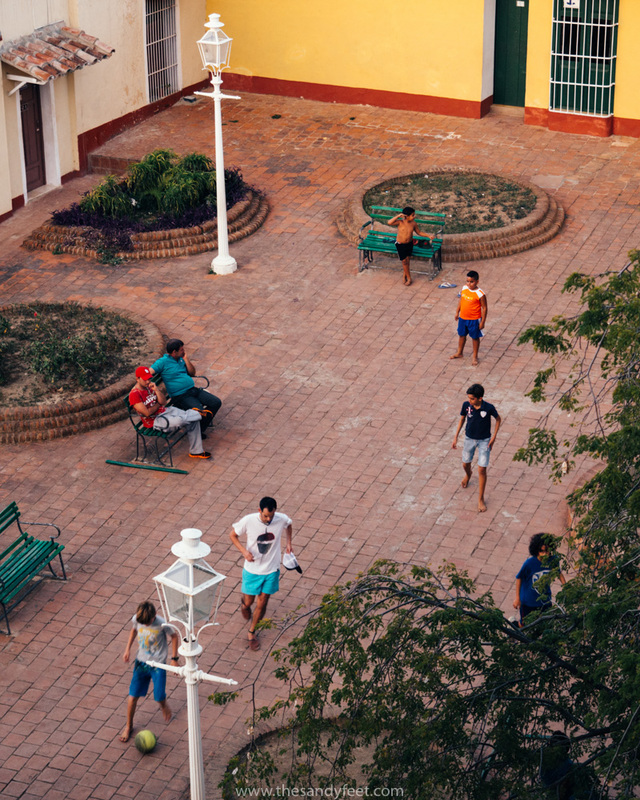 Tourists are more or less forced to take the tourist-only Viazul buses where people from all countries except Cuba can sit together in a comfortable and air-conditioned space. On another platform the Cubans sit in less comfortable buses with broken windows and rusty seats. That is the real Cuban life and that’s what we wanted to see but it is illegal for these local buses to take foreigners, like it is illegal for Cubans to pick up foreign hitch-hikers (although some do anyway). Many things are priced so as to be affordable only to foreigners and the use of two currencies, one worth 25 times the other, also creates an immediate divide between the unbelievably cheap and what appears ‘normal’ by foreign standards. 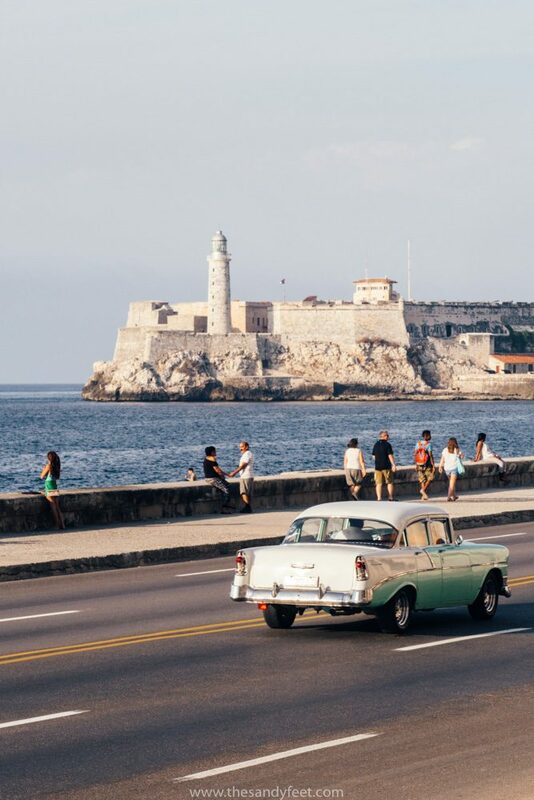 If tourism in Cuba continues like this unfettered, there may be very little of the exotic and vibrant culture that attracts us in the first place left to celebrate. We go on and on about the change that is coming but that tipping point is already here – the blade that divides a preserved history and culture and the invasive face of tourism that is at the ready to ram down its door. Given it is such a small island that has been shut out from much of the world, the impact of tourism is likely to overrun this small island much faster than it would most other places. In 10 years we may look back and think, ‘remember what Cuba used to be like?’ Much like travellers from the 80s are still lamenting over the lost paradise of Koh Phi Phi or Goa. Obviously, we get the irony in this sentiment – wanting to visit a place where a vibrant culture is preserved yet being annoyed that the previous generations of travellers have either destroyed it when we finally get there or simply making it so crowded that it is impossible to enjoy. We are one of the many. We know we are just as much part of the problem as any other visitor. Plus, given the hardships most Cubans face, these changes are probably quite welcome. On our final day of Cuba we felt a sense of relief that we were leaving. The fantasy we had built up in our minds before arriving had slowly melted into obscurity and was all but shattered by the end of our trip, but we still couldn’t shake that lingering feeling that perhaps we had missed out on something great. It wasn’t just the battle with the crowds or the feeling that we were often viewed as a walking dollar sign, it was the gradual built-up to our realisation that an entire system had been put in place designed to stop us from truly experiencing a place and the sadness that the Cuba we all dream of visiting has probably already passed us by. We admit we made a few mistakes on our trip which makes us question whether this would have changed our experience entirely. Had we visited in low season with a less restricted budget that enabled us to get way off the beaten path, things may have turned out differently. A country we had expected to fall for instantly gave us only a few fleeting moments of joy. 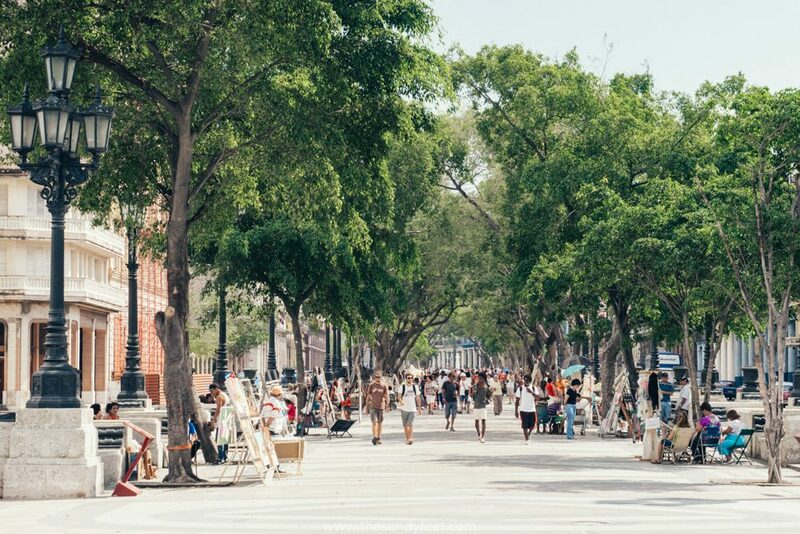 Even now looking back at pictures of our trip, it feels like they capture the entire essence of Cuba, but it is the Cuba we had imagined before we ever set foot on its sandy shores, not the story of the Cuba we experienced. For us our trip to Cuba was a complete mind flip. A conundrum we have spent weeks over the past five months discussing and one we still cannot make sense of. 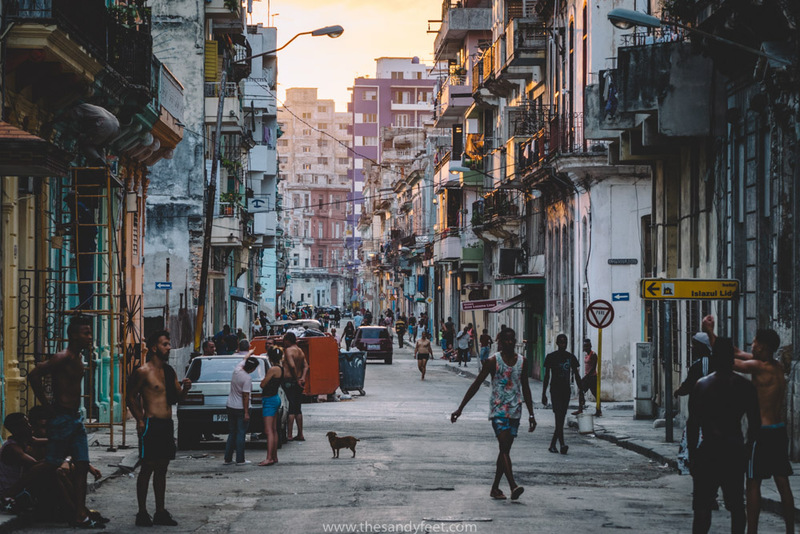 We wrote this piece not to insult Cuba or to discourage anyone from visiting but to offer a different perspective on travel there. Everything we have read, even now, offers nothing but radiantly shiny reviews on the country, gushing assurances that ‘You will LOVE it!’ Well, we didn’t and these were the reasons why. Although most travel blogs proclaim otherwise, not everywhere will blow your mind and not everywhere will be perfect for you. Everyone that visits a place will have a different experience and yours may be the complete opposite – in a different season, meeting different people, on a bigger budget – but this was ours. 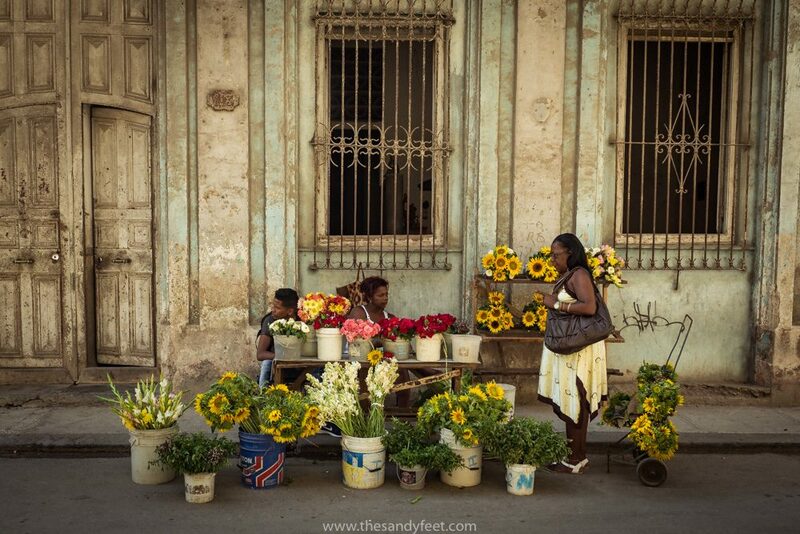 We spent only three weeks in Cuba which is never enough to fully experience a place, especially somewhere like Cuba. In a sense we are curious to go back, to travel it differently and let it redeem itself in our minds. Perhaps the tourist wave will die down, but, at this stage, it seems unlikely. It was difficult to articulate why we felt our experience in Cuba was lacking but hopefully for all those out there still hoping to discover Cuba ‘before it all changes’ this may act as the wake up call you need. Go now (preferably out of season), leave your expectations on the plane and don’t believe it is waiting to be discovered because that ship has sailed, many years ago. Have you been to Cuba recently? What were your impressions? Where should we have gone that would have won us over completely? If You Are Heading To Cuba Read this Post First! Nicely written. My wife and I have found a few places like this. I feel guilty sometimes, especially when other folks seem to love a place. It makes me feel like maybe I’m jaded, which I don’t think I am. This was a really well rounded piece, though. Thank you for the perspective. Thanks a lot for your comment Jason. For us it was a huge surprise and a really confusing experience because all we had ever read were these glowing endorsements. And yes, then came the guilt! I guess you can’t love ’em all. I was in Cuba nine years ago. Already at that time some things you described about Havana I felt as well. 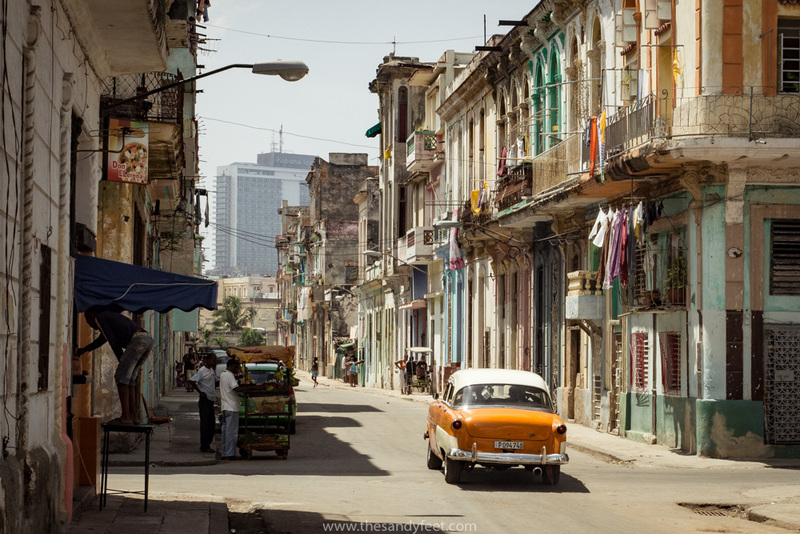 Amd already then I felt that it was very difficult to get a real insight into Cuba in the more touristy places. It felt like the police was observing that tourists and locals dont spend time together and even though i speak spanish and lives in Mexico, I was not able to find a real local club or bar in havana, because the locals where afraid to take you there as it was forbidden to bring foreigners to the real local places. Thanks for your comment. It must have been really interesting to see all those years ago and quite intense with the police always watching. It’s such a strange feeling to know that there is a whole other world going on right in front of you that you can’t even get a glimpse of.